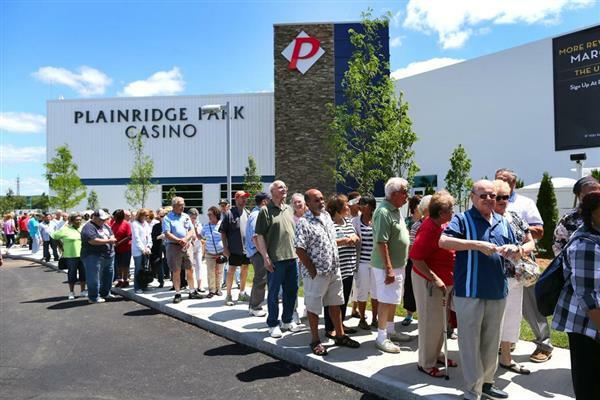 Plainridge Park Casino has opened, and with it, the era of Las Vegas-style, round the clock gambling in Massachusetts has begun. We're there for that first trip round the clock to tell you how it's going. Plainridge is mobbed. 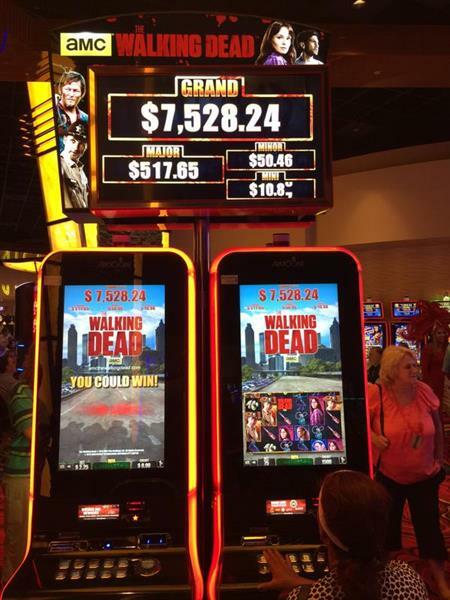 Not every slot machine is taken, but we're getting there. Still plenty of good seats for virtual blackjack though. Getting a lot of questions about where the players club is. Many senior citizens surprised to learn I don't work here. Plainridge is packed just after opening. Boston Globe staff photo by John Tlumacki. 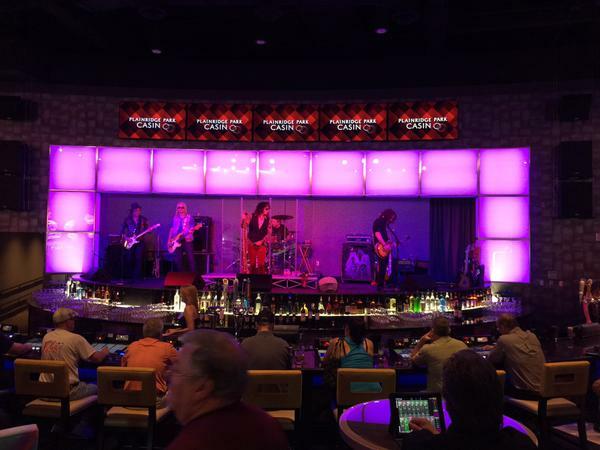 Here's the video for that same Aerosmith cover band. 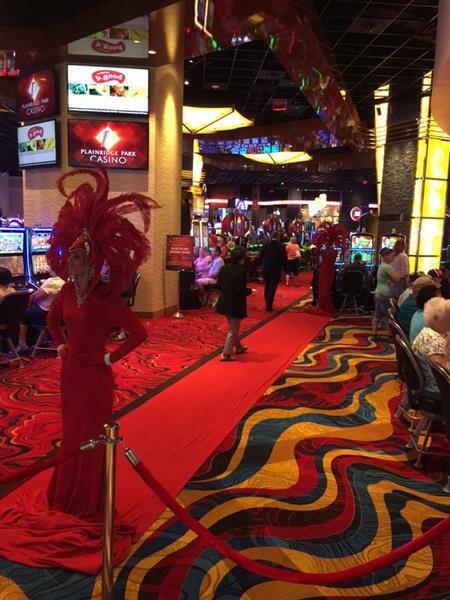 Just on style points I might've opened with "Walk This Way" or "Sweet Emotion" rather than "Same Old Song And Dance" at the opening of a casino but maybe that's just me. Dave Bartkiewicz is pretty sure he was the first gambler in Massachusetts' casino era. had beaten him by nearly half an hour. But the wiry Bartkiewicz was determined to be the first to try his luck, and had a fairly obvious foot speed advantage over the stout Conroy. "I'm going to run right past him," Bartkiewicz whispered conspiratorially, peering over his glasses, as the men waited at the front of a hundreds-deep line behind them. -- though it helped that the tortoise either didn't know or didn't care that he was in a race. "I'm not fussy," said Conroy, who wasn't expecting to be first in line to begin with. 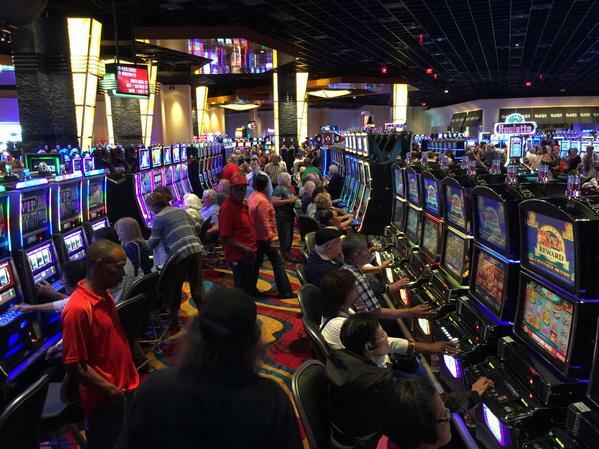 He just wanted a slot machine -- "one that puts out," he said. "He was wandering around," Bartkiewicz said. "I just sat at the first machine." 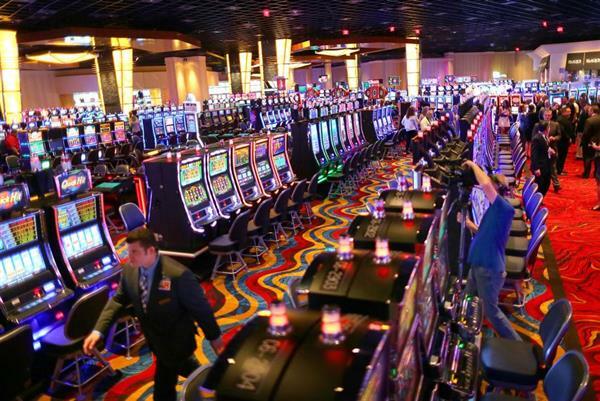 The prize for being (maybe) Massachusetts first slot player? "I lost $20," Bartkiewicz said. "Who cares?" Jesse Rezendes of Carver just got body-blocked out of seats at the Ellen machine by two women whose combined age and weight is about 180. Cars are still pouring in. This place is totally slammed. 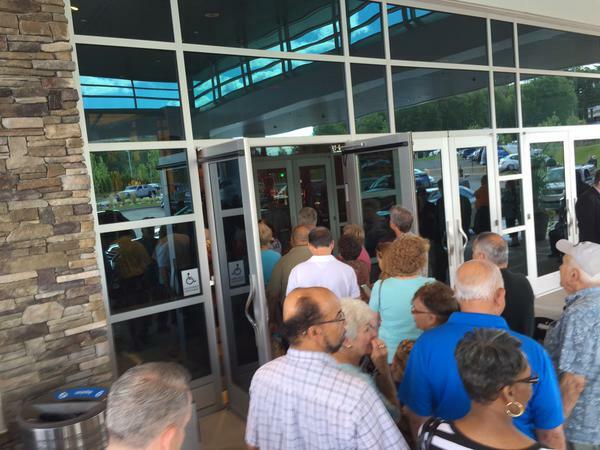 By about 2 p.m. the crowd at Plainridge was so thick that lines were forming behind many of the 1,250 slot machines. 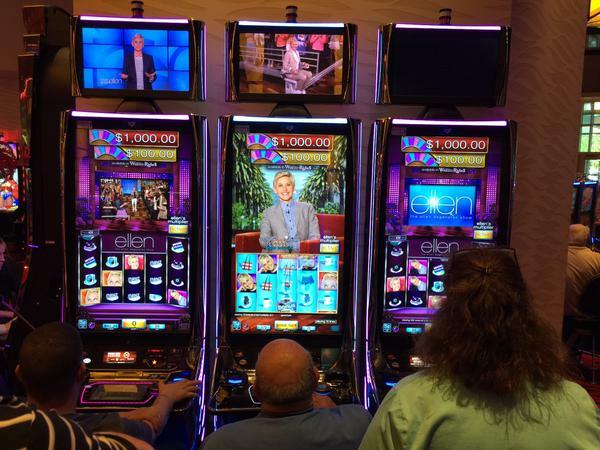 Jesse Rezendes was among a small group waiting patiently for a seat at one of three Ellen Degeneres themed machines. “It’s kind of weird,” he said of the daytime talk show host’s gracing of a high-tech gambling device. 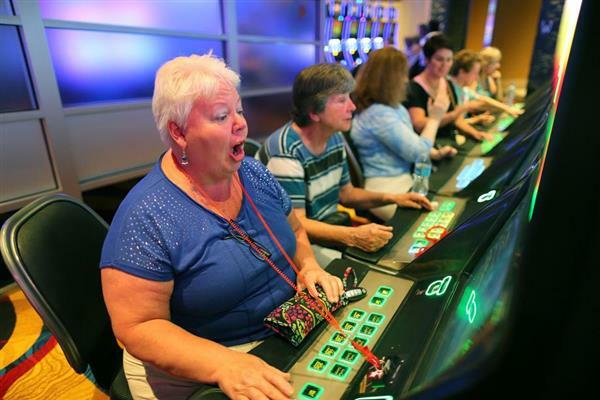 But it turns out there are a lot of Degeneres gamblers around. One tiny senior citizen after another shouldered the burly Rezendes out of the way. 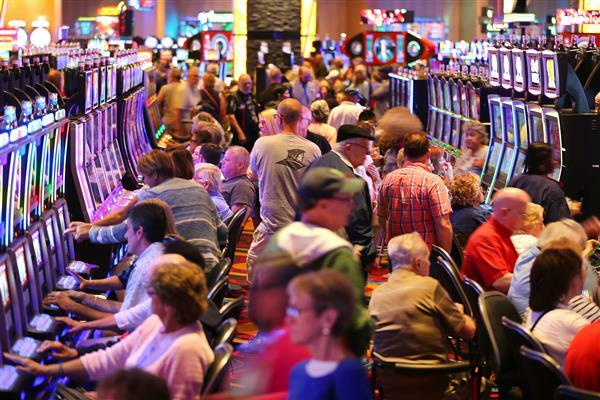 Rezendes, who made the 35-minute drive from Carver and usually visits nearby Twin River and makes occasional trips to the big Connecticut casinos. Plainridge is closer and — even more appealing to him — smoke-free. That alone will be enough to keep him coming back — assuming he can find an open machine. 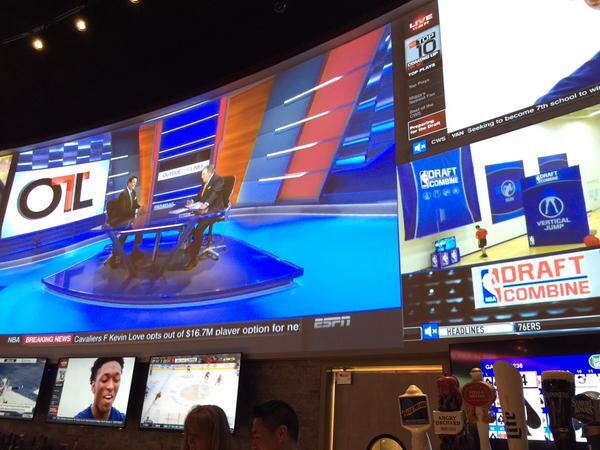 Food options: Flutie's sports bar, The Bean coffee shop, Slice pizza and b. good burgers. Also Slack's, a high end steak/oyster place. 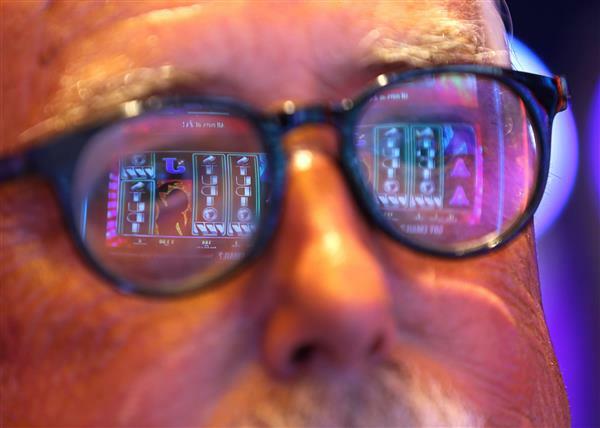 Staff say the house plans to lower the limits on some virtual table games. $15 blackjack is doing ok; $25 blackjack is mostly abandoned. 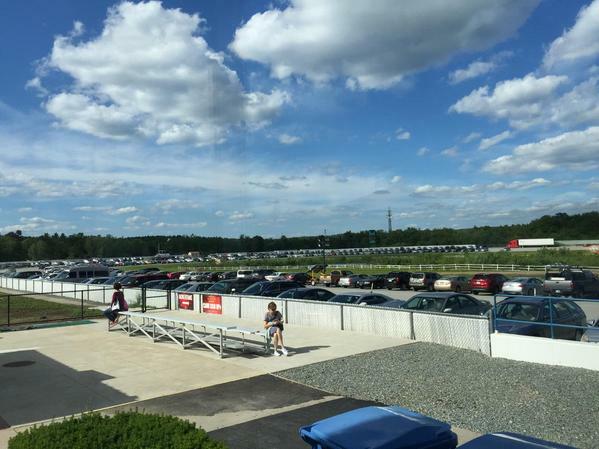 Parking lots are overflowing here at Plainridge. Someone showed up in an 18-wheeler and parked it on the horse track. Jeff Guertin did not come here to gamble. "Every cent that I earn is already spent," said Guertin, 58, of Berkley. 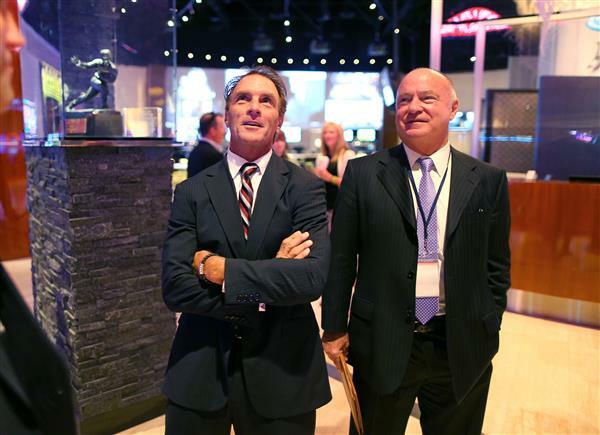 But when he heard that Doug Flutie would be in attendance for the Plainridge Park Casino ribbon cutting, he turned up to get an autograph on a photo of the former Patriots and Boston College quarterback executing a dropkick. 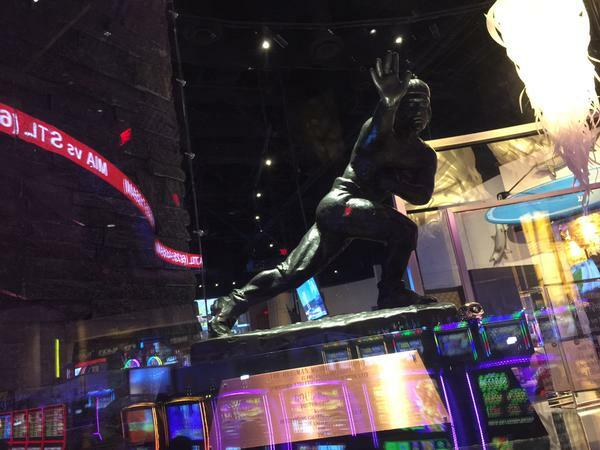 "I got here at 1:30," Guertin said, waiting alone in the sports bar that bears Flutie's name and displays his uniforms and Heisman Trophy. "My timing was off." 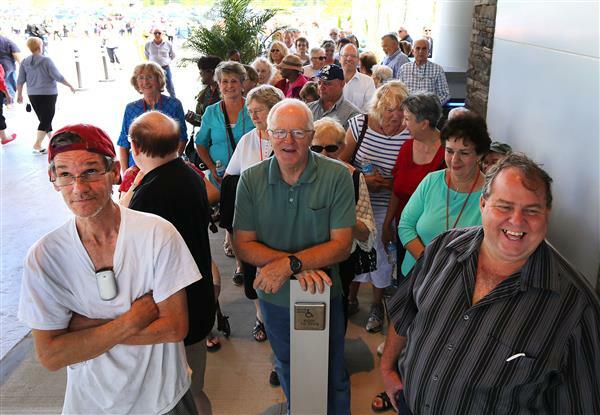 In fact the elusive quarterback had scampered out of the casino hours earlier, drawing shrieks from some of the hundreds waiting in line before the doors opened. A rumor that he might return later was enough to get Guertin to stick around for a while. "I'd hate to leave and find out he came five minutes later," Guertin said. Please send tips on how I can look less like a #plainridgepark casino employee. Crowding is starting agitate people. Tina Clark and Linda Blandin said they waited an hour for food. Had been waiting 20 mins for their car. They said they'd give it another try when the opening crowds dissipate and some of the glitches are ironed out. Pro tip: don't go out the front door to smoke. By the time you get back in and find your husband, he'll be destitute. Use the patio. These tips are useless by the way. If anything I look MORE like an employee. I'm just going to give up and learn where everything is. Nobody pulls the lever anymore. Always with the buttons. 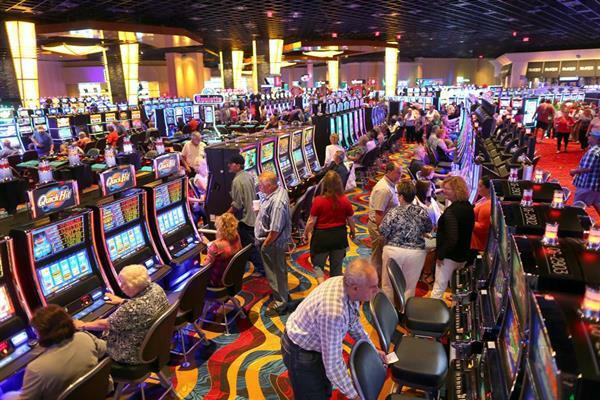 Compared to cacophonous casino, the OTB is an oasis of silence. Pro tip 2: if you're coming now, use the garage entrance even if you park elsewhere. Much shorter line.